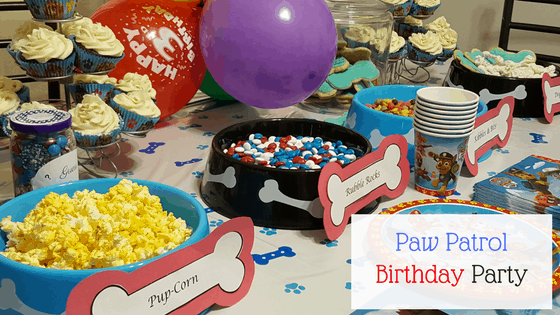 Paw Patrol Themed Birthday Party! When we asked my son what he wanted for his third birthday, he requested a Paw Patrol themed birthday party! It came as no surprise because he loves the show and absolutely loves Chase and Marshall. The first thing I knew I wanted to do was make some Kibbles & Bits. It was really fun to come up with different ingredients to make it look like the real Kibbles & Bits! Everyone enjoyed snacking on this snack mix. Not only that but it was really tasty! I made my Dark, Decadent, and Delicious Chocolate cupcakes with vanilla buttercream frosting per my son’s request of course. They were delicious! Click the link for the recipe. I made dog bone sugar cookies using this cookie cutter and topped them with royal icing. We placed these bones in a “treat jar.” It got a lot of laughs. I made chew bones made out of pretzels, mini marshmallows, and white chocolate. These were a huge hit and everyone thought they were cute and fun to eat. This snack also was a favorite because of the sweet and salty taste. Who doesn’t love some “pup-corn”? Pretzel rods worked great as “fetch sticks” and were really cute, too! Something that we always do at birthday parties is something called the guess jar. We fill a jelly, pickle, or canning jar with candies and have everyone at the party guess how many are in it. Whoever is the closest wins! It is something that both adults and children look forward to. Of course the party decor brought it all together and made the party a hit. My son enjoyed everything and had so much excitement he passed out on my lap shortly after the party was over. I’m calling this party a success! Are you planning a party? What’s the theme going to be this year? What a fab idea for a party and so well executed! Thanks for sharing all your tips and the beautiful outcome! Oh my gosh, your ideas are so creative, and your food pics are making me hungry! We don’t usually do big parties (instead we save the $ to fly to visit family, since they’re all far away) – the two theme parties we’ve done so far are a Dinosaur party and a Mexican Fiesta. The dino party was themed mostly in the decorations and favors, but in the fiesta, that was easy because I cook Mexican food all the time at home, and my daughter LOVES it – her friends were surprised to find how much they love it, too! This is such a creative idea. I truly love this and wished there was an adult version! This really seems like a cool birthday idea for the dog lovers. Sounds and looks like an awesome party! I love all the food you made. Super cute ideas! And they sound yummy too…especially those cupcakes!